Originally from New York State, Joe Gavin graduated in 2000 from the New England Conservatory of Music in Boston with a Bachelor in Clarinet Performance. Following graduation, Joe headed west to serve on staff with Chi Alpha in Washington State. In the fall of 2008, Joe launched the Chi Alpha ministry at the University of Vermont (UVM). In addition to serving as campus pastor at UVM, he is also Chi Alpha’s District Director for Northern New England. 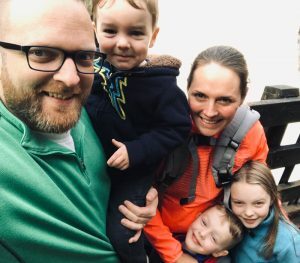 Joe has been married to Chi Alpha alumna, Rachel, since 2006 and they have three children: Jaeda (10), Silas (6), and Caleb (3). Joe shares how his journey of faith in Christ began in Chi Alpha, as well as the challenges of campus ministry in New England. When I was a student, I got to a point where I was really facing a crisis of faith and meaning. I was raised Roman Catholic. When I got to college, it was nominal in nature, so I really started asking the big questions in college: Is there a God? If so, what does He think about me? What does it mean to live a life of significance? I saw in my friends who were part of Chi Alpha something I’d never seen before, which was real genuine faith, passionate love for Christ, a genuine experience of God, and His presence in their lives. I wanted what they had and they were faithful and committed to me. They loved me, pursued me, and their love and God’s love wore me down. When I really started seeking Christ and pursuing a relationship with him, there were some key individuals who poured their lives into me. My friends would talk to me for hours, praying with me. They included me in their lives, offered me real friendship, and shared their lives with me. What are some of the challenges and rewards of campus ministry at UVM? I’d say some of the biggest challenges are the nature of how post-Christian and unchurched the student population is. Most students have had no exposure to the gospel or Jesus, so we’re really building at ground level with most of them. Those who have an opinion of Christianity are mostly negative. Students who do follow Christ have to make a very clear and difficult choice for something countercultural and uncomfortable in terms of their peers and professors. It’s genuine and great to see their faith and passion for Jesus. As missionaries, we see students coming to faith with no background in Christianity. They come with all kinds of sexual brokenness and addiction, but their lives are being dramatically changed because of Jesus. I love to see that change happen where students live for Christ as a result. New England has a reputation for being a place of spiritual hard soil, especially on the university campus. What is Chi Alpha doing to plant the seeds of revival? What Chi Alpha is doing for today’s student is what it did for me as a student. When it’s dark, the light shines that much brighter. When Chi Alpha offers a countercultural community that incarnates the love, grace, and power of Jesus, when there’s a group of students whose lives together show that God is real and He’s good, students are drawn to it. They see something they’ve never experienced before. The vision is the same, to replicate missional communities on campuses throughout New England. If we stick to our core values and our model of doing discipleship, community, and mission on campus, we’ll see campuses changed. We are praying for our Chi Alpha groups in other parts of the country to see the need and to send workers. As the movement builds here in New England, we can continue to raise up workers as well. What advice do you have for alumni who have a desire to reach the campuses of New England? First, I would say pray. Become invested in your prayers. Visit, give a year, and do a CMIT (Campus Missionary-in-Training) program. We have CMIT programs here at UVM. Come experience campus ministry here in New England. Get trained. As our Chi Alpha National Director, E. Scott Martin, says, “Give a year and pray about a lifetime.” I miss the Northwest, but New England gets under your skin. It’s challenging, it’s hard, and at times it feels lonely, but I can’t imagine being anywhere else.